Natural yeast sesame is basic to all my breads. Two Kitchenaid mixers used to mix “sponge”, four pounds in each simultaneously, and then flour added to stiffen dough for first rise. Here’s our plain oven that handles eight boules at a time, with microwave above which is handy warm place for second rise. Boards- cut to perfect size- hold rising boules in microwave for 8-10 minutes. Granite counter to right for sesame brittle and peanut brittle. Two four-pound batches of dough in baskets on boards where boules will have second rise. Two four-pound batches of dough in linen-lined baskets rising, almost ready for forming. Eight boules in the oven, half-baked. BREAD is Life- Or at least Lively! Coarse salt on top of most of my breads make butter unnecessary. Just eat it. 1975: I baked from the Tassajara bread book when my neuroscience graduate studies and lab worked allowed. 1995: A cousin gave my wife and me a bread machine for our wedding as a gag. “I hope this improves your baking skills” his card read. My wife’s father Louis Kane is the co-founder of Au Bon Pain and Panera bakery restaurant chains. That “gag gift” turned into a hobby and passion. I love to bake bread. I bake for family, friends, and the local food shelf. I used to make a loaf or two; I used a bread maker to make the dough, then hand kneaded and hand shaped boules (round loaves baked without a loaf pan) for the second rise and baked in my oven. Now I mix a wet dough (sponge) in two KitchenAid mixers, and add flour until just the right stiffness. I usually make eight one pound boules at a time in my home oven. 2005: Pam Behn from Warren gave me some starter. Wow. Bread flavor! Still going, still giving it to other people who want starter. I have made as many as 88 loaves for Thanksgiving baskets in one evening. I bake anywhere I travel, taking sesame seeds and sourdough starter with me and buying local flours. 2012:I began baked twice a week for the Interfaith Council’s Food Shelf. Eight loaves- one for my family and seven for Food Shelf. 2015: New Farmers Market in Waitsfield on Sunday needed more vendors. Landlord for my book shop wanted rent caught up. So I started baking for money as well as love. Maybe, in the beginning God made yeast. The starter I was given ten years or so ago has now transformed or evolved, so it is healthy yeast at my altitude, in the warmth of my kitchen from whatever grows in the 10,000 tress on our 25 acres of Fayston mountainside. My woods have a perfume, and the starter I now have makes bread that tastes really good. a fresh batch of starter smells sour- acetic acid, like vinegar- in 24 hours, and I could use it then for “sourdough” bread. A day or two later it smells more like cheese, rich and fragrant, and maybe too strong to eat. When baked, this yeast simply tastes like real bread. For thousands of years, people have tried ot nurture yeast to make bubbles in bread and beverage and other fermented foods. It tastes good. The bubbles are useful. And if the yeast does not have enough oxygen, it make alcohol- which is both an antibacterial and a complicated stimulant/relaxant. My yeast has plenty of oxygen, and I nurture it for taste. For a batch of four one-pound boules, I use a half cup of my starter. And my starter mug is then replenished with 1/2 cup of flour and 1/2 cup of water. Stirred. Like soupy toothpaste. I kept two starter mugs going, and increase the number or make a big pot of starter for a Big Bake. Cut into halves or quarters for two or one pound loaves. Fold sticky side together, keep outside dry and floured. Shape into four balls or place in form. Thumbs up, pull down hands in V shape on sides of ball, stretching outer surface down and under. Keep lightly floured. Place in oven. Dash ¼ cup water in bottom of oven. Close door. Notes: Flour- I buy 50 bags of King Arthur’s white flour at the IGA, which they say is their “special flour”. It is in fact their bread flour. I have also used plain white store brand flour. Starter- I have had a starter since about 2004, so I would guess by now it is yeast from the Vermont mountain air. I have not yet found a way to use it so that yeast is not necessary to get a good rise in an hour. It bubbles fine and smells strong. It saves for weeks in the frig. I use it every day or every other day. While it may not do most of the rising in the dough, it adds great texture and flavor. On the other hand, without starter, any fresh baked bread is likely better than store-bought. Holler if you want some of my starter. Yeast for bubbles– I buy one or two pound bags/blocks of commercial ADY yeast at the IGA- silver /plastic vacuum bag. I keep some in a small jar in the frig for daily use, and refill it from the bag as needed. Both keep fine in frig. The starter yeast adds flavor; the commercial yeast is the powerful rising stuff. ADY is Active Dry Yeast. Rapid rise yeast works fine too. The salt on top is just for flavor when eating. If bread is kept in humid atmosphere, salt will get top of bread damp. I skip it in humid weather. I use Kosher salt, and made myself a coarse salt shaker from a plastic bottle. I reduce the salt inside the bread, which helps it rise faster. Oven Stone, baking pan? I bake on an oven stone, or floor tiles, or an upside down cookie tray when traveling. Bread often sticks to metal trays. Flour the loaf bottom well. I use corn flour if possible to avoid sticking. I use flour dusted on the counter and a 1/4 plywood tray for second rise and baking. I cut two trays to fit perfect in my microwave- one above, one below, each with four boules, which is a convenient place for second rise. GETTING STALE ? Bread does not just go stale or moldy; it changes and should be used accordingly. 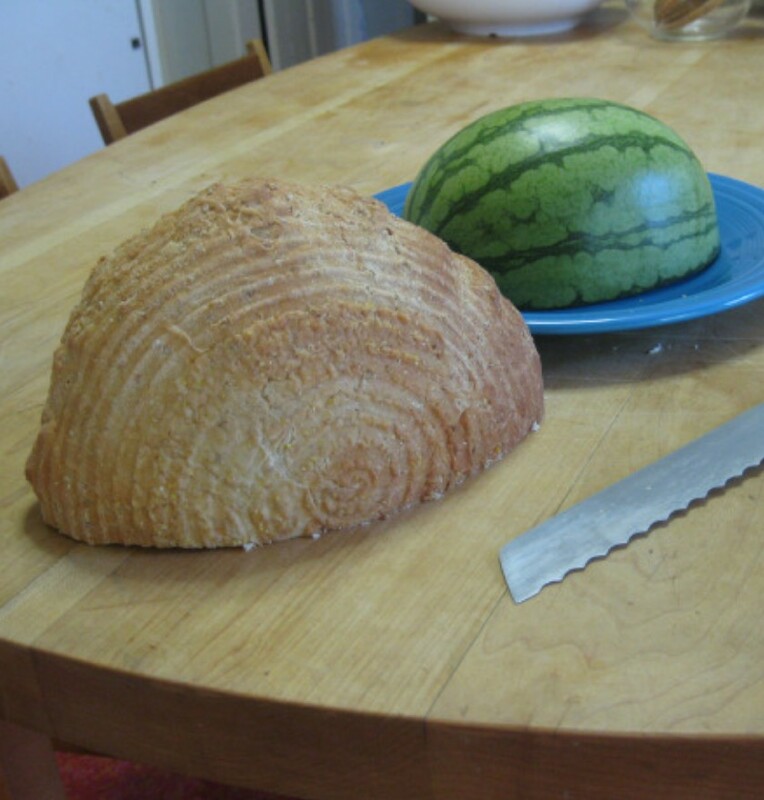 Fresh bread is delicious but often too fragile to slice. After cooling a few hours, bread is usually fine to slice for toast or sandwiches. After a day or so, the bread may be dried enough to use only if toasted, and after that perhaps only for croutons or bird food. Quick trip to microwave will release water from sesame seeds and wheat granules to renew two-day old bread. Restart STARTER I keep two mugs of starter on kitchen counter. After using a mug of starter, I add 1/2 c flour to mug, and 1/3-1/2 cup cool water. After baking, I put hot loaves on the counter to cool with two dish towels over them . I often put eight boules in a big cardboard box for transport, or a canvas bag..
FREE STARTER I would be delighted to give anyone a small jar of starter. Every day or two I add ¼ cup flour and enough water to mix it into a paste. I keep it is a coffee cup, covered with a plastic lid. When the rim gets caked with flour and water, I transfer to a fresh coffee mug, and soak the old one. The starter bubbles then gets more fluid as it “eats” the flour. When I use the starter, I simply dump most of it into the dough batch, and use what sticks in the jar (usually a coffee mug) as the continuing starter with a ¼ cup flour and some water. I use the same table knife for dumping the starter out and to mix up the fresh starter- so it’s one messy table knife instead of two. A table knife mixes starter in a deep coffee mug better than a spoon. Easier to clean. I use a clear plastic bread box which has holes. It avoids mold for three-four days. Actually we keep two of these bread boxes on counter, one with today’s and one with yesterday’s bread, usually two types of bread. Sometimes the bread just stays on the counter under a dish, or in a paper bag, or plastic bag. Option A: Oatmeal: Substitute one cup of flour with one cup of oatmeal. Makes a dark sweet bread. Pumpernickle is much heavier and dense. Option C 2015- I no longer use coffee. Avoid caffeine and bitterness. Use 3 TBS black cocoa in four pound batch. Also use black sesame seeds for appearance, not taste. roll into long cylind, then roll cylinder into snail. Pinch seam, let rise, and bake. Option E- Rippled dark and light: Split dough and roll black cocoa into half for dark bread. Divide into half loaves, and roll out. put two half loaves together, light and dark, fold a few times, and form into boule. Really fun for kids at birthday party to play with colors of dough and make designs to bake- layers, spirals, etc. I am not trying to be Gandhi, who made his own salt and his own clothes to protest government restrictions. I simply enjoy building my own house and baking my own bread. I am lucky to live in Vermont where a little oven heat is usually welcome even in the summer. It is good to share, even while keeping some fresh bread for yourself. Bread is more about how you bake than the recipe, though the sourdough starter and the sesame seeds are the “secrets” of my bread. Perhaps my favorite bread was a loaf baked in a rented condo with a big handful of fresh rosemary. A little fresh rosemary or thyme is good in fresh baked bread. A lot of fresh rosemary or thyme is GREAT! Finally, kneading is good exercise, or meditation, or both. Thank you Tassajara years ago! Big bakes: March 2012- Cub Scout Pack baked 48 loaves at Waitsfield Church- most went to Barre Food Shelf, sort of annual now. Oct 2012- baked 60 loaves at home for my 60th birthday weekend. Nov 2012- baked 80 loaves at Waitsfield Church with Food Shelf volunteers for Thanksgiving baskets. 2013 too? Notes: 11/23/08 Flour has doubled in price this year, so have sesame seeds. For about the same price as tan sesame seeds, I buy black sesame seeds in bulk through my health food store. Great for Miranda’s Black Bread AKA Maplenickel. Same recipe as above, but substitute 2/3 cup of coffee and 2/3 cup water for the 1 1/3 cup water, and add ¼ cup molasses, ¼ cup maple syrup, and two tablespoons of Black Cocoa. I roll up a silicone sheet to bake on when travelling. At home I do first rise at 100 degrees for 60-75 minutes in linen-lined baskets. Amounts of flour and water are relative to the flour- if you form boules, you need stiff flour for them to not collapse, which keeps your hands clean anyway. I made 1/4 inch plywood rectangles that fit perfect inside my over-the-stove microwave. One of the rectangles has legs to stack. I can put eight one-pound loaves in the microwave for the second rise, while the oven is heating to 460. The light under the microwave keeps it a good temperature for rising bread. I use flour to dust the cutting board or silicone sheet I proof on, and I dust the baking tile in the oven with corn meal in a special “salt” shaker I made. No more sticking.